MURRIETA, CA, September 15, 2018 — Pardee Homes wants to show their gratitude to those who serve the community by offering a $2,500 savings on new homes at their two neighborhoods, Braeburn and Tamarack, in Murrieta. This special savings credit is a thank you to police, firefighters, active and veteran military, nurses and school teachers. If you already know Spencer's Crossing, then you know what a great opportunity this is to live in an exceptional community that offers the very best blend of rural charm, resort-style amenities and top performing schools. Tamarack fits in perfectly with modern, family-friendly living on the inside and timeless architecture on the outside, offering a selection of four dynamic floor plans with a range of three to five bedrooms, two and one-half to three and one-half baths and approximately 2,811 to 3,684 square feet. Three plans are modeled, including the unique Residence 2, a single-story home offering a second-floor bonus room with optional wet bar or fifth bedroom. Residence 3 is zoned for growing families with its spacious great room and first floor den. A large downstairs bedroom suite offers added living options and a second-floor loft complements the three roomy upstairs bedrooms. Residence 4 combines luxury living with practicality with Pardee Homes' exclusive GenSmart Suite™ option creating a home within your home for multi-generational families. This four-bedroom home has a game room or optional fifth bedroom, covered patio, big bonus room and three-bay garage. Pricing at Tamarack is from the high $400,000s. Homes at Braeburn range from three to five bedrooms and two to three baths with approximately 2,010 to 2,884 square feet. Three plans are modeled, including the unique Residence 2, a single-story home with second floor loft featuring a powder room, extra storage and an optional wet bar. Plans 3 and 4 are traditional two-story homes with gracious entries, den or full bedroom bath downstairs, second floor lofts and three-bay garages. Plan 1 is a coveted single-story home with included covered patio and den or optional fourth bedroom. Centered around the great room, dining room and kitchen, the spacious designs include an abundance of standard features such as gourmet kitchens with slab quartz countertops, a recycling center, convenient storage pantry, artisan-style single or dual compartment sinks and General Electric® stainless steel finish appliances. Elegant owner's suites have large walk-in closets and adjacent bath with Quartz solid surface countertops, large soaking tubs with separate shower and adult-height vanities. Braeburn is priced form the mid $400,000s. Surrounded by a recreation center, private parks, two pools, lighted sports fields, a dog park and 14 acres of trails, life at Spencer's Crossing is all about making the most of your leisure time. Two more parks opened this summer and residents have access to nearby private schools and the high-performing Menifee School District, as well as a STEAM elementary school in Murrieta. The community is close to historic Old Town Temecula, extensive shopping, premium golf and many remarkable wineries, yet affords residents easy access to I-215, I-15 and Highway 79. To visit Tamarack and Braeburn from I-215, exit at Murrieta Hot Springs and go east; head north on Winchester Road; left on Briggs Road; right on Baxter Road and left on Spencer's Crossing Parkway. 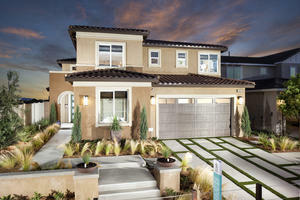 For more information visit www.pardeehomes.com or call (951) 429-1870.